Pay It Forward: Fun Places And Easy Ways To Volunteer In L.A.
We don't know about you, but sometimes the summer months can make us feel a little selfish. Indulging in the happiest of happy hours, lazy weekend mornings, and shopping 'til we drop can start feeling a little too freewheeling. All in good fun, for sure, but balance is key, friends! As much as living it up puts a smile on our faces, there's nothing quite as gratifying as giving back. The good news is that living in a huge metropolitan city like Los Angeles means there are endless opportunities to make a difference. From beauty buses to urban gardening initiatives, animal shelter visits to arts and sports mentorships, we've done the research to provide you with a shortlist of some of the best places to get your volunteer on. Don't let our docket stop you from doing your own digging — take a gander at the organization listing at L.A. Works — we're sure you'll find your calling. City of Angels? You bet. Go on and be one yourself! Share your stories and favorite local volunteer locations in the comments below. We certainly know the amazing, uplifting power of a little pampering. A new haircut, a great blowout, a fresh swipe of polish — sometimes, it's the small things that make the biggest difference. With L.A.-area home visits and pop-up salons, Beauty Bus offers an array of complimentary services to men, women, children, and their caregivers in need of a some TLC. Volunteer positions are available for beauty professionals and non-professionals alike. Find out more here, and who knows, maybe your newfound nail art skills can be put to a really positive use. Beauty Bus Foundation, 2716 Ocean Park Boulevard, Suite 1062 (at 28th Street); 310-392-0900. Have a talent, big or small? Earned varsity letters in a sport, or love to paint in your free time? Total yoga junkie? CoachArt, a non-profit organization that provides free arts and athletics lessons to children and adolescents with chronic illnesses, is always looking for individuals to share their passions. Volunteers instruct in just about anything you might want to teach — from art, music, and photography to yoga, acting, and cooking. 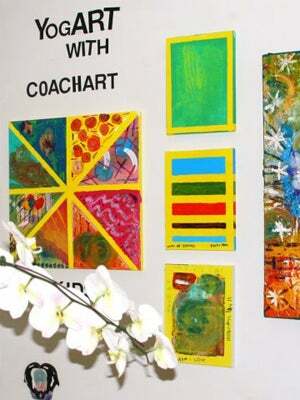 CoachArt, 3303 Wilshire Boulevard, Suite 320 (at South Virgil Avenue); 213-736-2850. R29 readers with writing chops and active imaginations, this one goes out to you. 826LA, a non-profit writing and tutoring center, provides a variety of free programming — after-school sessions, field trips, and workshops designed to challenge, enchant, and strengthen writing skills. The 826LA Young Authors’ Book Project gives students the amazing opportunity to participate in the publication of a book from start to finish. 826LA West, 685 West Venice Boulevard (at Pisani Place); 310-305-8418. 826LA East, 1714 West Sunset Boulevard (between Lemoyne and Logan streets); 213-413-3388. Everyone knows the age-old idiom about teaching a man to fish, right? Well, the power of urban gardening is not lost on us, either. L.A. Green Grounds, a grassroots community of volunteers, aims to help limited-resource families grow their own food, thereby improving nutrition, increasing access to fresh produce, and building relationships within communities. You don't need to be a hardened gardening pro to volunteer, but you'll certainly leave a regular Martha Stewart. We'll see you at the next Green Grounds Dig-In! L.A. Green Grounds; email here for specific information. If you're anything like us, you completely lose it at the sight of those cash register donation cans baring the faces of sad-eyed pups and kittens. And though we wish we could just scoop 'em all up and join Cat (or dog) Ladies Anonymous early, we're not so sure our apartments would be the best fit. Consider volunteering at the Friends of Animals Foundation, a non-profit, no-kill shelter dedicated to the "loving care and thoughtful placement" of its furry residents. As a volunteer, you'll get to cuddle and spend time with the rescued and found animals. Now, who's helping whom? Friends of Animals Foundation, 2336 South Sepulveda Boulevard (at Pico Boulevard); 310-479-5089.